This amazing wealth-harvesting genuine citrine crystal tree is packed with over 50 pieces of the expensive high grade golden natural pearl and empowered with 8 pieces of gold Chien Lung coins to guarantee the harvesting of wealth immediately and have it last forever. Extra expensive quality pearl is used to make this tree and they mimic flower blossoming. 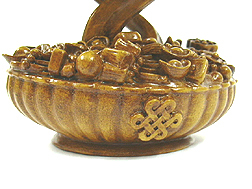 The pot with mystic knot symbols on the front and back is filled with gold ingots, the ruyi and unlimited amount of treasures to signify good fortune, wealth and abundance. 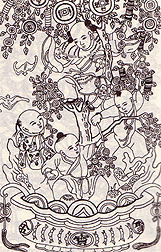 Meanwhile the trunk of the tree in made in the shape of a "twisted eight" to tap the Period 8 energy (2004-2023).Genuine yellow citrine had been endorsed by all Feng Shui masters to be the "Period-8 Merchant Gemstone". This is because period 8 (2004-2024) is earth element. Citrine being dugged from the earth is filled with pure earth energy. Furthermore its yellow color will further complement its earth energy. Therefore, citrine would be the most important crystal wealth energizer for Period 8. 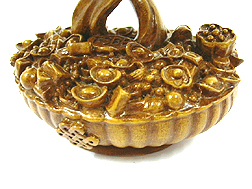 This item will invite more solid wealth luck and income luck for you throughout the next twenty years. Placed at cashier register and household, it guarantees prosperity for you. Note: This tree is made from genuine citrine gemchips and natural pearl, not like the ones that are "dyed" from quartz widely sold in the market. The item comes with a certificate of guarantee to authenticate the natural crystal and originality of make. What Pearl Citrine gem tree symbolizes and how to place the object? Natural Citrine is a potent gemstone of wealth. Citrine creates wealth luck, fortune, prosperity and more dollars in your income. This fabulous citrine gem tree is tied with potent gold Chien Lung coins, resembling a wealth wish fulfilling tree. The trunk is strong and solid to signify strong support on your wealth and income. The citrine gem tree is best placed in living rooms, wealth corners, cashiers and business desks to bring excellent "yang energy" for enhancing wealth and abundance. The high quality natural pearl can be eaten raw or ground into powder to be applied on human face to remove wrinkles. One can swallow the pearl to cure digestive problems, ease the process of giving birth, improve breathing and cure poisoning. It also signifies faith, purity, health and longevity. Those wearing the pearl can immediately feel the sense of tranquility, calmness, beauty and happy. That being the reason why the queens of the world would wear pearls most of the time. 1. 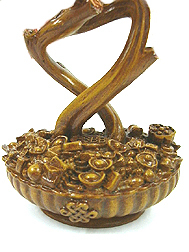 Place it in the southeast sector (wealth sector) of living rooms and business premises energize income, increase in wealth and prosperity and windfall luck. This is the most powerful sector to transmit your home's chi to become prosperity chi with the citrine tree. 2. Place it in the northwest to increase money luck from important people and helpful people. This sector is important for business pursuits and careers. Placing it in this sector will also bring you heaven's luck. 3. Place it in the north if you're seeking for material gains in career and increasing more recognition and promotion opportunities. 4. Place it on your work desk to create a differentiator between you and your competitors so that you could stay at the forefront of career advancement and salary increment. 5. Display it in the wealth corners such as the "sheng chi" location according to 8 Mansions Theory or the "water star 8" location according to the Flying Star Theory.